A step-up transformer converts low a.c. voltage into high a.c voltage and step-down transformer converts high a.c. voltage into low a.c voltage. The instrument is based on the principle of mutual induction. Structure: It consists of a rectangular soft iron core made up of laminated sheets. There are two coils which are not connected to one another in any way. These coils are wound on the iron core. One of the coils may be connected to a source of a.c. This coil is called primary coil and the other is called secondary coil. The e.m.f. of a.c. source applied across the primary coil is called input voltage and e.m.f. induced across the secondary coil is called output voltage. Principle: When an alternating e.m.f. is applied to the primary coil, a changing current flowing in it produces an alternating magnetic flux in it. This causes to change the magnetic flux linked with the secondary coil. An alternating e.m.f. is then induced in the secondary coil. It is called principle of mutual induction on which transformers are based. Transformers are used in voltage regulators for computer, television, air conditioner, record player, etc. It is used to transmit the alternating current over long distances. It is used for doorbells, welding purpose and in electrical furnaces. It can be used to prevent DC from passing from one circuit tothe other. It can isolate two circuits electrically. A transformer is a device used to convert low a.c. voltage into high a.c. voltage and vice versa. Transformer is of two types: step-up transformer and step-down transformer. A solenoid behaves like a magnet during the flow of electric current through it. Electric bell is a source of sound that converts electrical energy into kinetic energy and then to sound energy. Can transformer change the electromotive force (emf) of a dry cell? No, the transformer can"t change the electromotive force (e.m.f.) of a dry cell. 'The use of alternating current is limited without transformer.' Justify it. Transformer is needed during the both cases, either to increase the voltage or to decrease it. Without transformer no change in the voltage of alternating current can be made. That's why the use of alternating current is limited without transformer. Why is the core of the transformer laminated? The core of the transformer is laminated just to reduce the loss in input current. When electric current flows in the core of a transformer, the internal current i.e. eddy current (which flows in a circular way) is set up in the body of core. This current has heating effect on the core. The un-laminated core acts as a single block of iron which is heated due to high amount of eddy current. If the core is laminated, the amount of eddy current is highly reduced. Therefore, the core of the transformer is laminated to avoid the heating of a transformer. Define input current, output current, primary voltage and secondary voltage. Input current: The current that is given to the transformer is called input current. Output current: The current that is taken out from the transformer is called output current. Primary voltage: The voltage that appears across the primary coil of the transformer is called primary voltage. Secondary voltage: The voltage or potential difference that appears across the secondary coil of the transformer is called secondary voltage. Write any two differences between step-up transformer and step-down transformer. It increases the output electricity more than input electricity. It decreases the output electricity more than input electricity. It increases the magnitude of AC emf. It decreases the magnitude of AC emf. A circuit with 220 V is supplied with a fuse of 5 A. How many bulbs of 100 watt can be safely used in the circuit? Hence 10 bulbs can be safely used in the circuit. A transformer is of 220 volts primary voltage and 770 turns of primary coil. How many turns of secondary coil will be necessary in order to produce 120 volts from that transformer? Turns in secondary coil (N2) = ? he number of turns in the secondary coil is 420. Where and why is a transformer used? The transformer is used in alternating current either to increase the low voltage to high voltage to low voltage according to the required voltage. When AC supply is given to the transformer, the flux will depend on ______. In transformer, humming sound occurs due to ______. As compared the transformer with AC machines it is more efficient because ______. It doesnot have mechanical losses. It does not have copper losses. 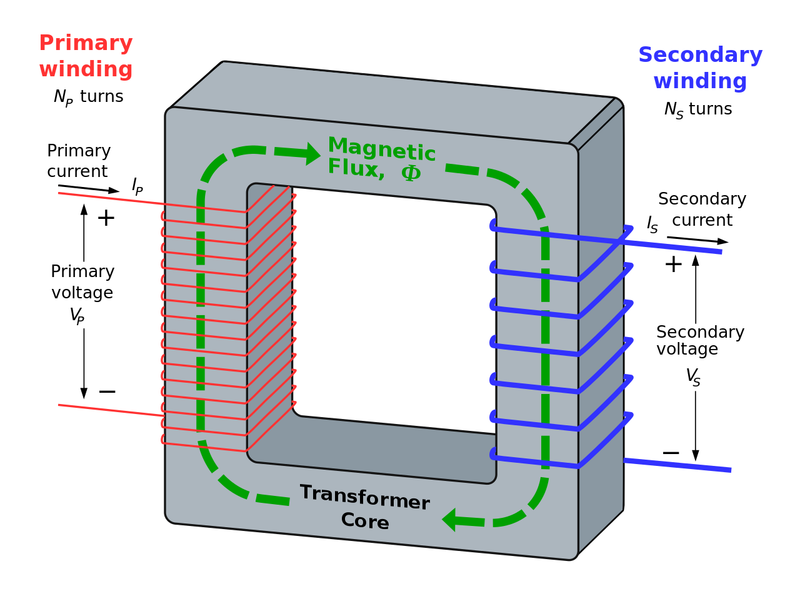 The primary and secondary winding of transformers are linked with each other by ______. Which parameter does not change during transformation action in transformer? Secondary current of a step down transformer is ______. equal to the primary current. The working principle of transformer depends upon ______. Faraday s law of electromagnetic induction. Fleming s left hand rule. All the answers are right. Which electricity is generated in the powerhouse? Which of the following substances are/is used to laminate the core? Why the number of primary and secondary coil never made equal? The input and output voltage of a transformers are 11000V and 220V respectively. Find the input current if output current produced in that transformer is 1650A. Any Questions on 'Transformer '?